Stop! 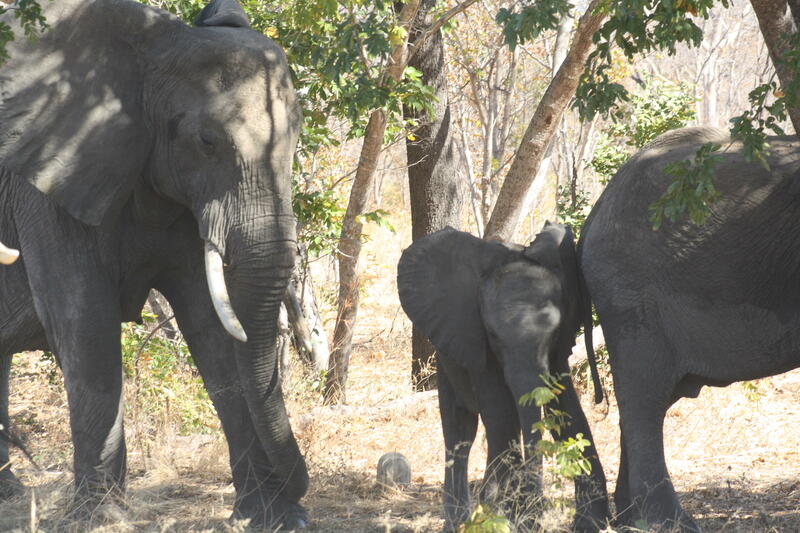 Elephants! We missed them at first, and drove straight past. Then we saw the herd in the rear-view mirror. A handful were eating by the side of the highway. 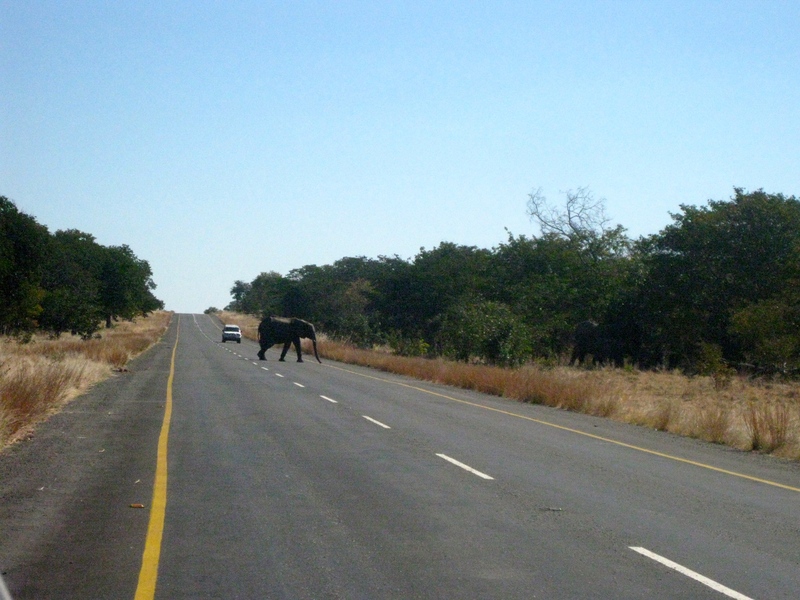 Another car pulled up and told us to go back the way we came; and sure enough, a few hundred metres away was the rest of the herd, at least forty of the biggest land animals on earth. There they were, just congregating like a flock of sheep on the highway. 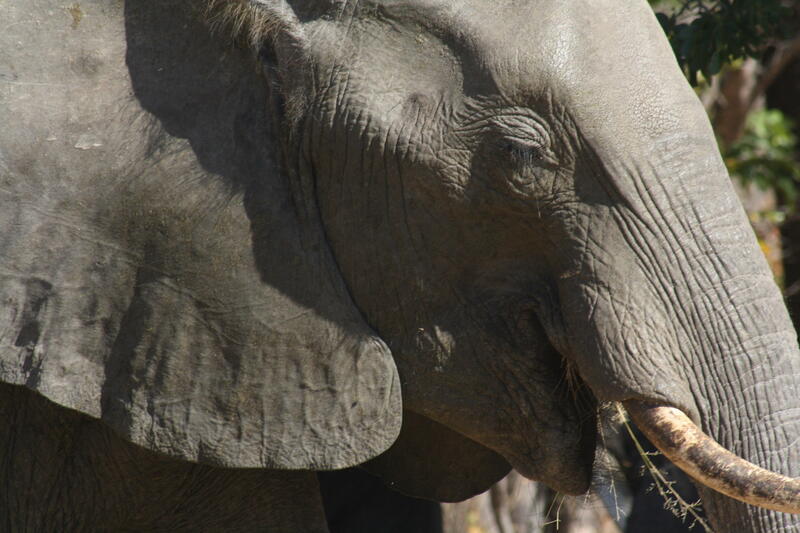 There were old bulls with wizened, wrinkled faces; calves and doting mothers; protective fathers, who intimidated our car face-on with ears raised in threat, boosting their profile and making them look bigger. 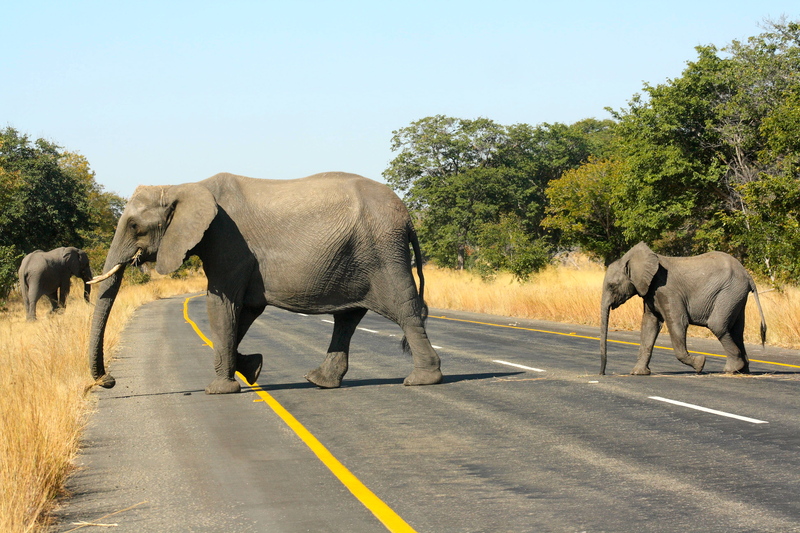 Elephants crossed the road, the youngest dutifully holding their mothers’ tails with their trunks in procession. We were in awe. Kasane was close. The border town was little more than a group of petrol stations with slick, oil stained roads and greasy take away shops. We hadn’t eaten a thing all day and were ravenous, so we scoffed down hamburgers at a local gift shop. 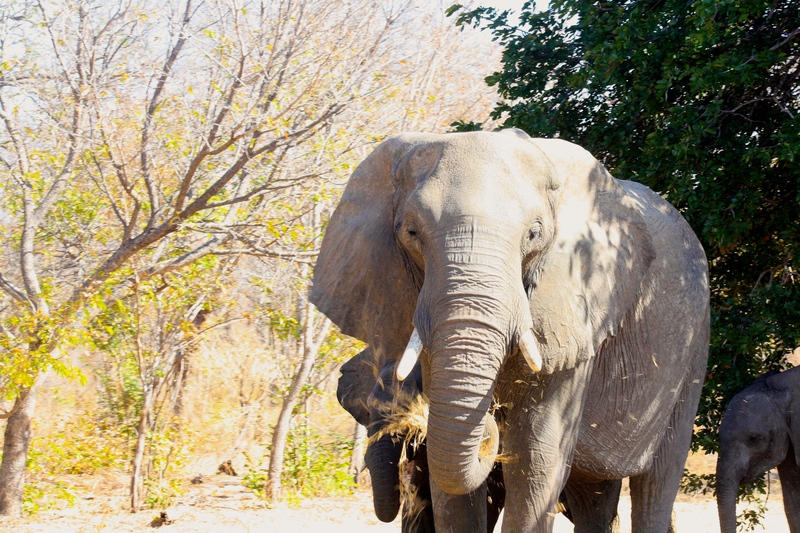 Whilst we browsed the cheap souvenirs, we got talking to some South Africans. “Why would you want to go to Zambia? There’s nothing there!“, they teased. “The border crossing takes a few hours, you’ll never make it over by sunset“, they continued, trying (for some reason) to dismay us. We rolled our eyes and carried on. Botswana and Zambia were seperated by the rushing Zambeze river, and the Kazangula ferry was the way across. We parked our car in the line of vehicles and waited for the ferry to arrive. Naturally, as the only white guys around, touts honed in on us like flies towards honey. We were swamped by people who wanted to help us cross the border, be our guides, guard our car, chaperone us, and change our money. By now we knew their game. We refused them at first, and when they persisted, we flat-out ignored them. The ferry arrived and we drove onto it, at the front of the ferry to be the first ones off. 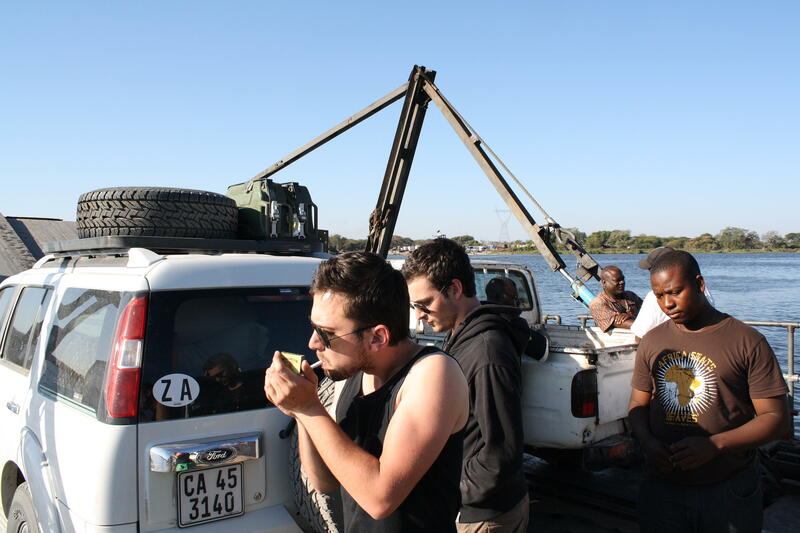 The ferry was loaded with cars and trucks passing into Zambia. All the while the touts continued to shake us down for money on the ferry. We grew ever more impatient, turning what would have been a relaxing ferry ride in the afternoon sunlight into a situation we couldn’t wait to leave. Jeff and I stared into the churning green river, and Wessel lit up a cigarette to calm down. 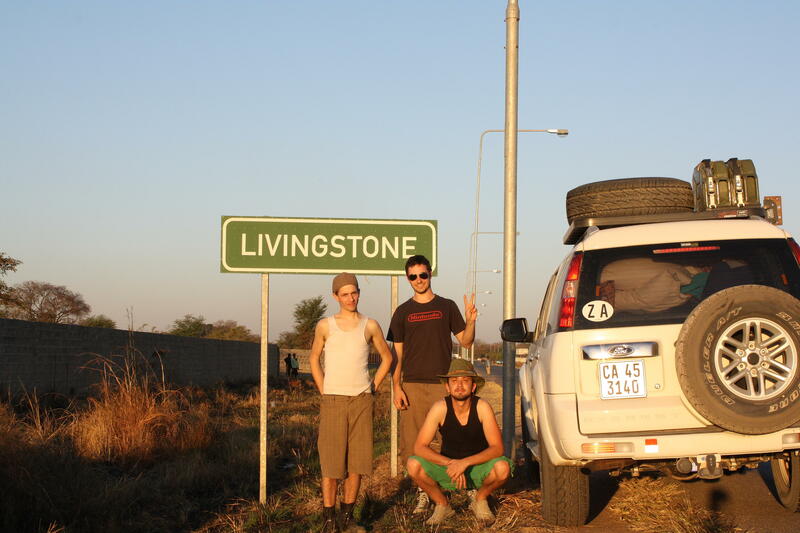 With a metallic clang, we disembarked down the steel gangplanks and our tyres touched the Zambian shore. The border here was a large, fenced off compound. We parked and made our way from building to building, stamping documents, visiting police, and paying fees. I stared disapprovingly at my passport stamp – a faint smear of blue ink, which didn’t show the date, or even the country. Oh well. TIA. Now in Zambia, the touts had vanished. Peace. Once again, the sun was setting, casting gorgeous long shadows along the tangerine landscape. Tomorrow, we would see one of the world’s largest waterfalls – Victoria Falls. I want to see that too! 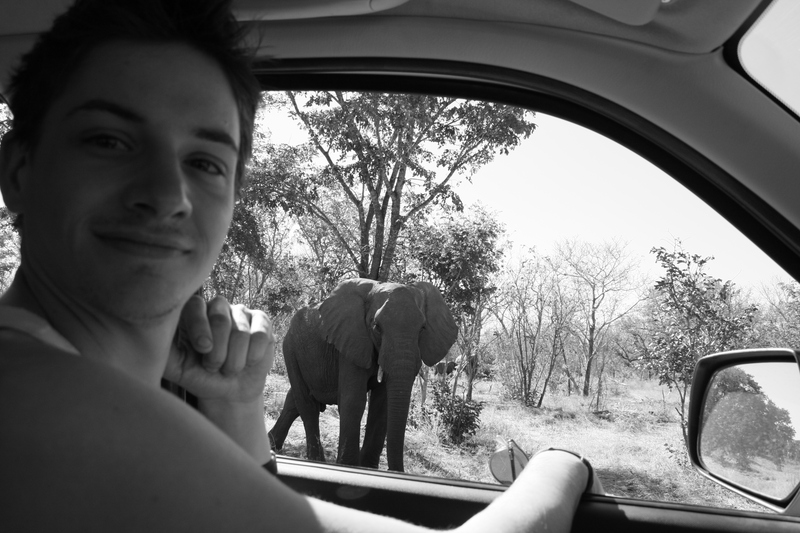 Your trip in Africa looks so awesome!